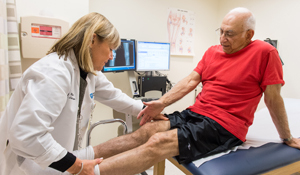 The Kaplan Joint Center surgeons have performed thousands of knee replacements, enabling patients to return to the activities their painful joints have forced them to give up. Total knee replacement surgery is done to replace an arthritic or badly damaged knee joint with highly engineered implants. The replacement part is called a prosthesis and is made of a combination of materials, including metal and polyethylene (plastic). Your surgeon will choose the prosthesis that is best for you. The goal of total knee replacement surgery is to increase mobility and improve pain. A knee replacement that has worn out or failed is replaced with a new implant. This procedure is done when damage to the knee is limited to one side of the joint, a condition called single compartment degenerative disease. The worn portion of the knee joint is resurfaced while the remainder of the joint is left unchanged. A minimally invasive procedure in which the surgeon inserts a tiny camera through a small incision in the knee and views the joint on a video monitor. The joint damage is repaired with thin instruments inserted into additional incisions. The surgeon corrects poor alignment of the knee or redistributes weight. The procedure is performed to relieve pain, improve function and prolong the life of the knee. The duration of a total knee operation is typically between two to three hours, but depends on the condition of the knee, the patient’s size and which procedure is performed. Your surgeon will give you an estimate of how long the surgery will take. Most knee patients spend from 2-3 days on the joint replacement floor— the Slotnick Inpatient Pavilion. The spacious, tranquil pavilion offers 24 private rooms with comfortable pullout sofa beds for family members and large, plasma screen televisions. The Joint Center uses the most up-to-date pain control techniques, a multi-modal approach which includes preoperative medications, long-lasting injections, oral medications and ice to minimize discomfort after surgery. Joint Center surgeons and our internist follow up after surgery to ensure recovery goes smoothly. Patients receive daily physical and occupational therapy during their stay. Many of our physical therapists have specialty training and advanced certifications in orthopaedics, and can offer a recovery and treatment plan tailored to the patient’s post-operative needs. The therapy program emphasizes mobility, range of motion and strengthening. Our care coordinator will coordinate discharge planning and the transition home or to an extended care facility. Our Knee Surgery Guide gives an overview of what to expect before, during and after knee replacement.